Artists of post-war Japan were driven to articulate that Japanese culture remained strong & their subconscious was void of any Western influence. The mania of rock’n’roll throughout Western society was shunned by Japan’s underground composers & artists in pursuit of sustaining their own identity. In some circumstances it was their religious beliefs; Otaka Prize winner Toshiro Mayuzumi described his composition ‘Mandala Symphony’ as “expressing a Japanese Buddhists view of the omnipotent universe”. The two decades that follow provide a fascinating, and at times, almost incestuous flow chart of influential artists from the modern era; John Cage, Yoko Ono, Toshi Ichiyanagi (Ono’s ex husband) & Takehisa Kosugi. Kosugi was the founder of Group Ongaku, a collective of musicians playing improvised compositions & performance pieces which draw correlations to the Fluxus movement. In 1963 Kosugi decided to leave Group Ongaku to focus on experimental music research. It was that decision which led him to score & record for a new cartoon series, Tetsuwan Atom (Atom Boy). Six years later Kosugi & six other, considerably younger, musicians formed the Taj Mahal Travellers. The band played mainly acoustic instruments including tympani, bass tuba, mandolin, harmonica, trumpet and santur. 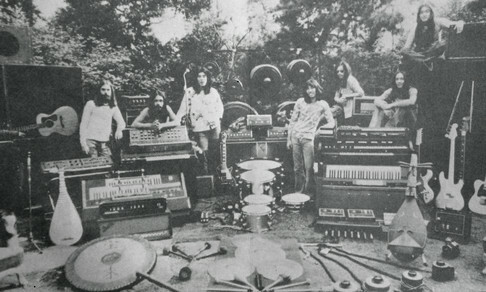 An array of hand-made instruments; voices, stones, bamboo winds’ and tree branches were used along with the electric violin, electric double bass & a Mini Korg analogue synthesiser.